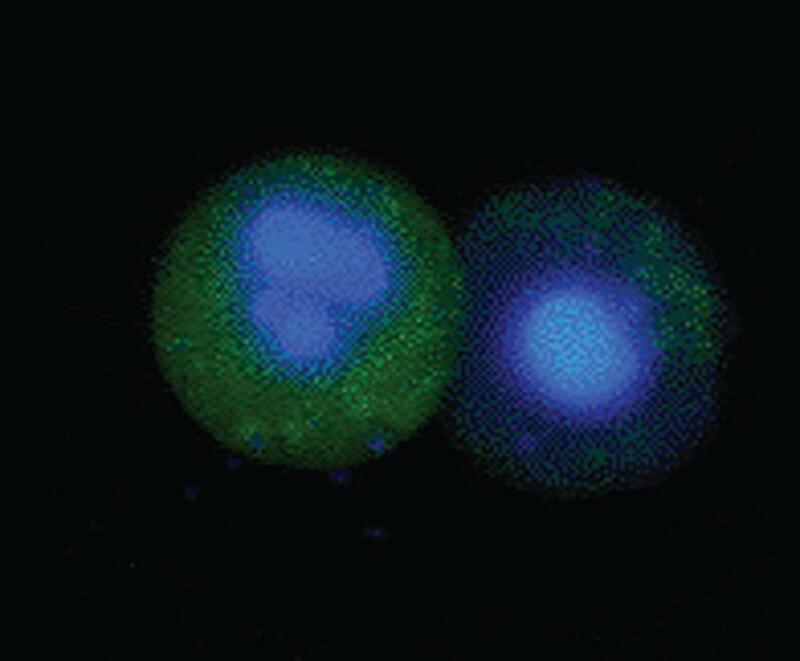 Jurkat cells were treated as shown with staurosporine at 1mM to induce apoptosis. The cells were then stained with Caspase 3/7 FAM FLICA™ (ICT093) and ReadiDrop™™propidium iodide (1351101). Apoptotic cells positive for caspases can be seen in the bottom right quadrant and dead cells positive for both caspase and PI in the top right quadrant. Healthy cells are negative for both stains. Data acquired on the ZE5™ Cell Analyzer. The FAM FLICA™ Caspase 3 & 7 kit uses a quick and easy method to analyze active caspases in apoptotic cells. Caspase FLICA™ kits measure apoptosis by detecting active caspases in whole, living cells. These kits do not work by using antibodies or as an ELISA. Instead, their methodology is based on a unique cell-permeable and non-cytotoxic reagent called the Fluorochrome Inhibitor of Caspases (FLICA). The FLICA™ reagent contains a caspase inhibitor sequence linked to a green (Carboxyfluorescein, FAM) fluorescent probe. The Caspase FLICA™ Kits are suitable for cells in suspension and adherent cells from many species including mammalian, insect and yeast. Different cell types, e.g. HeLa, primary neurons, macrophages and lymphocytes have also been successfully studied with these kits. This kit can be used with a flow cytometer, fluorescence microscope or a fluorescence plate reader using black microtitre plates. Store the unopened kit (and each unopened component) at +4oC until the expiration date. Protect the FLICA™ reagent from light at all times. Once reconstituted, the 150X FLICA™ stock should be stored at -20°C protected from light. FLICA™ is a trademark of Immunochemistry Technologies, LLC. Brugnon, F. et al. (2010) Apoptosis and meiotic segregation in ejaculated sperm from Robertsonian translocation carrier patients. Hum Reprod. 25 (7): 1631-42. Rébé, C. et al. (2007) Caspase-8 prevents sustained activation of NF-kappaB in monocytes undergoing macrophagic differentiation. Vacher, P. et al. (2015) Localized Store-Operated Calcium Influx Represses CD95-Dependent Apoptotic Effects of Rituximab in Non-Hodgkin B Lymphomas. J Immunol. 195 (5): 2207-15.